Zhao Ziyang (pronounced [ʈʂâu tsɹ̩̀jǎŋ]; pinyin: Zhào Zǐyáng; 17 October 1919 – 17 January 2005) was a high-ranking statesman in China. He was the third Premier of the People's Republic of China from 1980 to 1987, Vice Chairman of the Communist Party of China from 1981 to 1982, and General Secretary of the Communist Party of China from 1987 to 1989. He lost power in connection with the reformative neoauthoritarianism current and his support of the Tiananmen Square protests of 1989. As a senior government official, Zhao was critical of Maoist policies and instrumental in implementing free-market reforms, first in Sichuan and subsequently nationwide. He emerged on the national scene due to support from Deng Xiaoping after the Cultural Revolution. An advocate of the privatization of state-owned enterprises, the separation of the party and the state, and general market economic reforms, he sought measures to streamline China's bureaucracy and fight corruption, issues that challenged the party's legitimacy in the 1980s. Many of these views were shared by the then General Secretary of the Communist Party of China Hu Yaobang. His economic reform policies and sympathies with student demonstrators during the Tiananmen Square protests of 1989 placed him at odds with some members of the party leadership, including former Chairman of the Central Advisory Commission Chen Yun, former President Li Xiannian and former Premier of the State Council Li Peng. Zhao also began to lose favor with former Chairman of the Central Military Commission Deng Xiaoping. In the aftermath of the events, Zhao was purged politically and effectively placed under house arrest for the next 15.5 years. He died from a stroke in Beijing in January 2005. Because of his political fall from grace, he was not given the funeral rites generally accorded to senior Chinese officials. His unofficial autobiography was published in English and in Chinese in 2009, but the details of his life remain censored in the People's Republic of China. Unlike many Party members active in the 1930s and 1940s who later became senior Chinese leaders, Zhao joined the Party too late to have participated in the Long March of 1934–1935. He served in the People's Liberation Army, which was integrated into the Republic of China's National Revolutionary Army during the Second Sino-Japanese War, and the subsequent civil war, but his posts were largely administrative. Zhao's career was not especially notable before he emerged as a Party leader in Guangdong in the early 1950s. 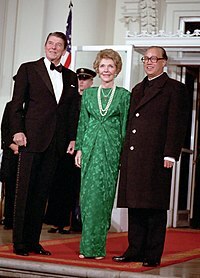 President Reagan walking with Zhao during his visit to the White House on 10 January 1984. Zhao developed "preliminary stage theory", a model for transforming the socialist system via gradual economic reform. As premier, Zhao implemented many of the policies that were successful in Sichuan at a national scale, increasingly de-centralizing industrial and agricultural production. Zhao successfully sought to establish a series of special economic zones in coastal provinces in order to attract foreign investment and create export hubs. He also developed policies to respond to rapid global technological change. Zhao's reforms led to a rapid increases in both agricultural and light-industrial production throughout the 1980s, but his economic reforms were criticized for causing inflation. Zhao promoted an open foreign policy, improving China's relations with Western nations in order to support China's economic development. One of Zhao's major cultural reforms included allowing the band Wham! to make a 10-day visit to China, the first by a Western pop group. Wham! 's 1985 visit, engineered by the band's manager Simon Napier-Bell, was a highly publicized cultural exchange and seen as a major step in increasing friendly bilateral relations between China and the West. Premier Zhao Ziyang of the People's Republic of China on a tour of the USS Arizona memorial on 7 January 1984. Student demonstrators, taking advantage of the loosening political atmosphere, reacted to a variety of causes of discontent. The diverse demands of protesters included greater economic liberalization, political democracy, media freedom, freedom of speech and association, rule of law, and to have the legitimacy of the movement recognized. Some protest leaders spoke against official corruption and speculation, price stability, social security, and the democratic means to supervise the reform process. Ironically, some of the original invective was also directed against Zhao. Party hard-liners increasingly came to the conclusion that the demonstrations were due to Zhao's rapid pace of reform, which they believed caused a sense of confusion and frustration among college students. The protesters may have been encouraged by the imminent collapse of other Communist governments in Eastern Europe. Zhao treated the protesters sympathetically. The protests may have died down, but on 26 April he was obliged (as the Party General Secretary) to leave for North Korea on a state visit. While he was away, Premier Li Peng organized a meeting between Deng Xiaoping and the Standing Committee, in which Li and his allies convinced Deng that the protests were threatening to the Party. Following the meeting, Li had the People's Daily publish an article (which he attributed to Deng), which criticized the protests as "premeditated and organized turmoil with anti-Party and anti-socialist motives." Following the publication of Li's article, the protests grew to over 10,000 and spread to cities across China, notably including Shanghai and Guangzhou. Zhao attempted to mollify the protesters by engaging in dialogue with student groups. He attempted to institute numerous government reforms, including the creation of a special commission to investigate government corruption; but, according to Zhao, the commission was ineffective because "Li Peng and others in his group actively attempted to block, delay and even sabotage the process." Zhao attempted to arrange a meeting with Deng in order to convince him to retract Li's "April 26 article". Zhao was granted a meeting with Deng on 17 May; but, instead of the private meeting he expected, he found that the entire Standing Committee was present. When Zhao advocated modifying the editorial, President Yang Shangkun proposed declaring martial law according to the decision of National People's Congress. Zhao refused to order the military to crush the demonstrations. After a bow, people began to applaud and some students burst into tears. That was Zhao's last public appearance, for Zhao had been ousted by party elders just before coming to the square (when Deng Xiaoping ordered troops, Zhao turned in his resignation). The phrase "我们已经老了，无所谓了" (Traditional Chinese: "我們已經老了，無所謂了") – "We are already old, we do not matter any more" – became a famous quotation after that. The protesters did not disperse. A day after Zhao's 19 May visit to Tiananmen Square, Premier Li Peng publicly declared martial law, leading to the deaths of hundreds to thousands of protesters on 4 June. In the power struggle that ensued, Zhao was stripped of all his positions and was put under house arrest. Following Zhao's dismissal, Jiang Zemin replaced Zhao as General Secretary of the Communist Party of China and successor of Deng Xiaoping. Over thirty ministers were dismissed as Zhao loyalists, and Zhao was widely criticized in the Chinese media. In the end, mentioning his name in the media was banned, while his photographs were airbrushed and he disappeared from textbooks. Zhao lived for fifteen years under house arrest, accompanied by his wife. The hutong in which Zhao lived had once belonged to a hairdresser of the Qing Dynasty Empress Dowager Cixi. Before his death in 1987 Hu Yaobang had also lived in the house. It was supplied by the Beijing government and is located in central Beijing, close to Zhongnanhai. Despite Zhao's house arrest, no formal charges were ever laid against him, and he was never expelled from the Communist Party. After his arrest, Deng and his successors continued to believe that Zhao and his subordinates had worked secretly to organize the nationwide protests, and worried that his death might trigger protests similar to the protests sparked by the death of Hu Yaobang. In Hong Kong, 10,000–15,000 people attended the candlelight vigil in remembrance of Zhao. Mainlanders such as Chen Juoyi said that it was illegal for Hong Kong legislators to join any farewell ceremony, stating "...under the 'one country, two systems' a Hong Kong legislator cannot care anything about mainland China." The statement caused a political storm in Hong Kong that continued for three days after his speech. Szeto Wah, the chairman of The Hong Kong Alliance in Support of Patriotic Democratic Movements in China, said that it was not right for the Communists to suppress the memorial ceremony. The twenty-four pan-democrat legislators went against the President of the Legislative Council of Hong Kong Rita Fan, who insisted that security be tightened at Tiananmen Square and at Zhao's house, and that the authorities try to prevent any public displays of grief. Similar memorials were held around the world, notably in New York City and Washington, DC where American government officials and exiled political dissidents attended. In the West, Zhao was editorialized as a courageous reformer and a political martyr. Although some of his followers have occasionally attempted to push for Zhao's formal rehabilitation since Zhao's arrest, the Party has been largely successful in removing his name from most public records available in China. Government efforts to delete Zhao's memory from public consciousness include airbrushing his picture from photographs released in China, deleting his name from textbooks, and forbidding the media from mentioning him in any way. Zhao's published autobiography is based on approximately thirty cassette tapes which Zhao secretly recorded between 1999 and 2000. The material in his biography was largely consistent with the information from the "Tiananmen Papers", an unauthorized collection of Chinese government documents published in 2001. The book was also consistent with material from "Captive Conversations", a record of conversations between Zhao and his friend Zong Fengming, which was published only in Chinese. According to Zhao's friend and former co-worker, Du Daozheng, Zhao only recorded the tapes after being convinced by his friends to do so. The recordings highlighted Zhao's heavy Henan accent (Central Plains Mandarin), making his Mandarin at times hard to follow. ^ 趙蔚 (1989). 第一章 故鄉、家世和童年. 趙紫陽傳 (in Chinese). 中國新聞出版社. pp. 4–12. ^ a b c d e f g h i j k l m n o p Becker, Jasper. "Zhao Ziyang: Chinese Leader Who 'Came too Late' to Tiananmen Square". The Independent. 18 January 2005. Retrieved 18 September 2011. ^ a b c d e f g h i j k l m NewropMag. "China: Zhao Ziyang has died!" Newrop Mag. 25 January 2005. Retrieved 10 September 2011. ^ a b c d e f "Zhao Ziyang". The New York Times. 25 January 2005. Retrieved 15 September 2011. ^ a b Ignatius, Adi. "Preface". In Zhao Ziyang. Prisoner of the State: The Secret Journal of Zhao Ziyang. New York, NY: Simon and Schuster. 2009. ISBN 1-4391-4938-0. p.xii. ^ a b c d Ignatius, Adi. "Preface". In Zhao Ziyang. Prisoner of the State: The Secret Journal of Zhao Ziyang. New York, NY: Simon and Schuster. 2009. ISBN 1-4391-4938-0. p.xiii. ^ Bramall, Chris. "Origins of the Agricultural 'Miracle': Some Evidence from Sichuan". The China Quarterly. No. 143, September 1995. p. 733. Retrieved 10 September 2011. 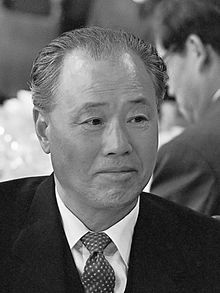 ^ a b c d e "Obituary: Zhao Ziyang". BBC News. 17 January 2005. Retrieved 15 September 2011. ^ Gewirtz, Julian. "The Futurists of Beijing: Alvin Toffler, Zhao Ziyang, and China's "New Technological Revolution," 1979–1991". The Journal of Asian Studies. 78 (1): 115–140. doi:10.1017/S0021911818002619. ^ McCarty, L. Y. (2010). "'Big in Japan': Orientalism in 1980s British Pop Music". The Mid-Atlantic Almanack. 19. ^ Neville, Sam (28 April 1985). "ROCK: East meets Wham!, and another great wall comes down". Chicago Tribune – via ProQuest. ^ Fulford, Robert. "There's no Right to Know in China". The National Post. 22 January 2005. Retrieved 20 September 2011. ^ Santolan, Joseph. "Social inequality and the Yangtze River drought". World Socialist Web Site. 18 May 2011. Retrieved 20 September 2011. ^ Yardley, Jim. "Zhao Ziyang, Chinese Leader Purged for Supporting Tiananmen Protesters, Dies at 85". The New York Times. 17 January 2005. Retrieved 16 September 2005. p.2. ^ Forney, Matthew, and Jakes, Susan. "The Prisoner of Conscience: Zhao Ziyang, 1919–2005". TIME World. 16 January 2005. Retrieved 15 September 2011. ^ "赵紫阳之后的中国". Open Magazine. Retrieved 3 November 2012. ^ "股份制改革是市场行为吗？". Financial Times. Retrieved 9 November 2012. ^ a b MacFarquhar, Roderick. "Foreword". In Zhao Ziyang, Prisoner of the State: The Secret Journal of Premier Zhao Ziyang. New York, NY: Simon and Schuster. 2009. ISBN 1-4391-4938-0. p. xix. ^ MacFarquhar, Roderick. "Foreword". In Zhao Ziyang, Prisoner of the State: The Secret Journal of Premier Zhao Ziyang. New York, NY: Simon and Schuster. 2009. ISBN 1-4391-4938-0. pp. xviii–xix. ^ Wang Hui. China's New Order: Society, Politics, and Economy in Transition. Ed. Huters, Theodore. Cambridge, MA: Harvard Press, 2003. ISBN 0-674-02111-8. pp.56–57. ^ a b c Pomfret, John. "In Posthumous Memoir, China's Zhao Ziyang Details Tiananmen Debate, Faults Party". Washington Post. 15 May 2009. p.2. ^ a b Pan, Philip P. "Chapter One: The Public Funeral" in Out of Mao's Shadow: The Struggle for the Soul of a New China. ^ Pan, Philip P. "Chapter One: The Public Funeral"
^ Wu Guoguang. "The Sacrifice That Made a Leader" Archived 8 July 2012 at Archive.today. TIME Magazine. 17 January 2005 (Vol.165, No.3). Retrieved 20 September 2011. ^ a b c d Link, Perry. "Book Review: 'Prisoner of the State: The Secret Journal of Zhao Ziyang'". The Washington Post. 17 May 2009. Retrieved 20 September 2011. ^ Garnaut, John. "Twenty Years on - Legacy of a Massacre". The Age. 30 May 2009. ^ a b c "赵紫阳同志遗体在京火化 贾庆林等为遗体送别" (in Chinese). Xinhua. 29 January 2005. Retrieved 21 March 2017. ^ a b c "Chinese Media Muted on Zhao Death". BBC News. 18 January 2005. Retrieved 15 September 2011. ^ Pan, Philip P. "Chapter One: The Public Funeral". Out of Mao's Shadow: The Struggle for the Soul of a New China. ^ a b c "Online Tributes to Zhao Ziyang". BBC News. 17 January 2005. Retrieved 15 September 2011. ^ Spence, Jonathan (26 January 2005). "Martyr Complex". The New York Times. ^ Wu Nan. "Babaoshan Struggles to Meet Demand as Cadres' Final Resting Place". South China Morning Post. 23 September 2013. ^ Kahn, Joseph. "China Gives Zhao's Death Scant Notice". The New York Times. 18 January 2005. Retrieved 18 January 2005. ^ Reuters and The Chicago Tribune. "Mourners pay respects to ousted Chinese leader" Archived 7 January 2009 at the Wayback Machine. The Seattle Times. 19 January 2005. Retrieved 20 September 2011. ^ Pan, Philip P. "Chapter One: The Public Funeral" Archived 15 July 2011 at the Wayback Machine. Out of Mao's Shadow: The Struggle for the Soul of a New China. 2008. Retrieved 20 September 2011. ^ Long, Kathy (17 January 2019). "A reformer China's ruling party wants to forget". BBC News. Retrieved 18 January 2019. ^ Reuters. "China Magazine Praises Ousted Zhao in Test of Taboo". China Digital Times. 2010. Retrieved 15 September 2011. ^ Fenby, Jonathan (2009). The Penguin History of Modern China: The Fall and Rise of a Great Power, 1850 -2009. Penguin Books. ISBN 0-7139-9832-6. ^ The Tiananmen Diaries, Perry Link, Washington Post, 17 May 2009. ^ Ching, Frank (9 August 2010). "Another tongue that's not so common after all". SCMP. Hong Kong. This page is based on the Wikipedia article Zhao Ziyang; it is used under the Creative Commons Attribution-ShareAlike 3.0 Unported License (CC-BY-SA). You may redistribute it, verbatim or modified, providing that you comply with the terms of the CC-BY-SA.